Now In Stock – Limited Quantities! 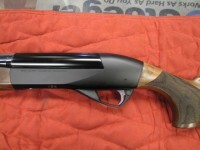 At the 2014 Shot Show Benelli has presented the next generation of its Inertia Driven® Autoloaders. 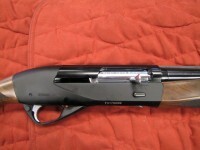 This elegant semi-automatic 12-gauge shotgun is called the Ethos. This new semi has all the latest technology including , the ability to cycle the lightest loads, even 7/8 ounce, and a patented Progressive Comfort® recoil reduction system that provides less felt recoil. ETHOS stocks are cut from beautifully figured AA-Grade European walnut and are designed specifically to incorporate the patented recoil reduction system. The ETHOS features a replaceable carbon fiber rib that reduces overall weight. 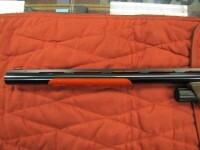 The interchangeable front sight enables shooters to quickly switch between red, green or yellow fiber-optics, which come standard with the ETHOS. A newly patented anti-seize magazine cap incorporates a synthetic bushing in the magazine cap, preventing it from binding in foul weather or dusty conditions. 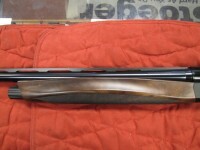 12 AA-Walnut 28″ 5-C, IC, M, IM, F 3″ 6.6 lbs. 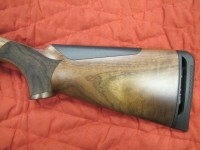 12 AA-Walnut 26″ 5-C, IC, M, IM, F 3″ 6.5 lbs. 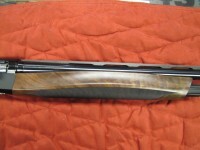 12 Walnut 28″ 5-C, IC, M, IM, F 3″ 6.6 lbs. 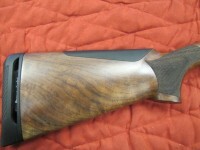 12 Walnut 26″ 5-C, IC, M, IM, F 3″ 6.5 lbs. 20 AA Grade Satin Walnut 26″ 5-C, IC, M, IM, F 2-3/4″ or 3″ 5.5 lbs. 20 AA Grade Satin Walnut 28″ 5-C, IC, M, IM, F 2-3/4″ or 3″ 5.6 lbs. 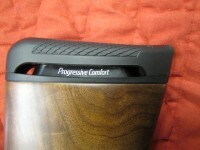 Inertia Driven, Progressive Comfort recoil reduction system, AA Grede European Walnut, easy locking system, two-part carrier latch, beveled loading port, larger bolt release, carbon fiber rib, interchangeable front fiber-optic sight, brass mid-bead. Stock Dimensions: Length of Pull: 14 3/8 inches, Drop at Heel: 2 ¼ inches, Drop at Comb: 1 ½ inches (Includes shim kit to adjust drop and cast). 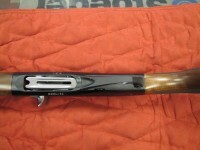 Finish: Blue or nickel-plated receiver with blued barrel. Recommended Minimum Load: 7/8 oz.